How was your September? Did you succeed in keeping up with NOFA-NY’s Locavore Challenge? I have to admit, there were times I cheated. But overall I think I did pretty well. Even on vacation in Long Island and Vermont, I sought out local treats to satisfy my appetite. Keeping up with the whole 30 days is hard. Even I couldn’t manage. In Vermont we ate at the Simon Pearce Restaurant that had a fantastic list of Vermont beers. I could have been local, but I really wanted a glass of wine. So I went with a Rose from Oregon. At least it was domestic, I guess. Well October brings more fun. October is one of my favorite months of the year in fact. 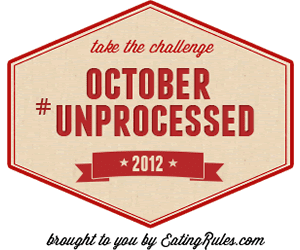 Besides being my birthday month, (October 11th, hint, hint), it’s also October Unprocessed, sponsored by Food Rules. The challenge for this month is to rid your diet of processed food. Sounds hard, right? You’re thinking, oh my god, I don’t have time to cook all the time, I need processed quick meals! But wait, this challenge isn’t necessarily about making everything from scratch, unless you want to. You can eat store bought food, you just need to be conscious about its ingredients. As long as it’s something you could make yourself, if you had the time, it’s okay. So take bread for instance. It’s basically flour, water, yeast and salt. If you had another 4-5 hours in your day, I’m sure you could whip it up daily. But, unfortunately, you don’t have the time. None of us do. So buying fresh bread from the bakery is fine. On the other, that packaged bread on the store shelf, with all those preservatives and chemicals you can barely pronounce? That’s bad. Stay away. So whole food good, chemicals bad. You got it! You can join me in taking the Unprocessed pledge here. I try to keep processed food out of my diet as much as possible, so in honor of October Unprocessed, I’m going to go a bit further. I’m going to make foods that I can buy, unprocessed, and make them from scratch. Not everyday, that would be crazy, but once a week. Things like yogurt or bread or pasta. These things are unprocessed from the store, but I feel like learning to make them from scratch gives you a better appreciation. So here I go!